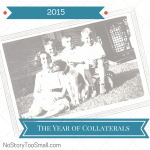 Posted in 52 Ancestors Challenge on January 29, 2015 by Amy Johnson Crow. It seems as if the favorite activity of genealogists when it’s snowing is to hunker down and do some research. It sure beats shoveling the driveway, that’s for sure! 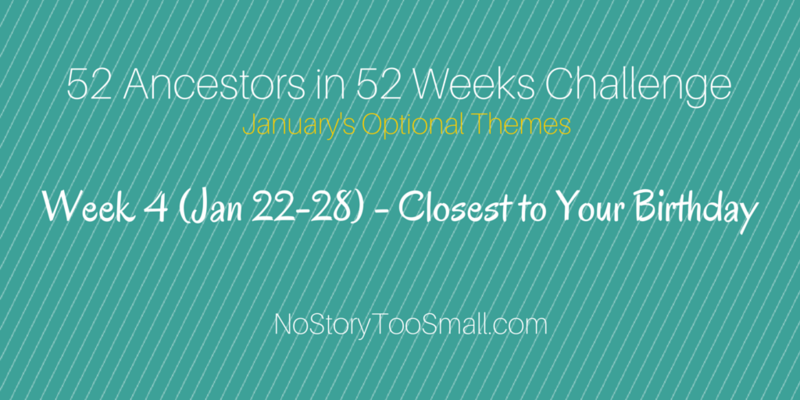 The theme for Week 4 of 52 Ancestors was “Closest to Your Birthday.” It’s a fun way to look at the people in your family tree. For Judy Everett Ramos, that person was a girl named Frank. Cara Jensen of Sherlock Homes almost shares a birthday with her grandfather; her photos are great! Julie Goucher of Anglers Rest took a different view of birthdays, and explored some children who were born and died between census years. I share a birthday with several people in my family tree. I focused on my great-grand-aunt Addie Sarah Kelley. Maybe I should call her my great-grand-maiden-aunt. 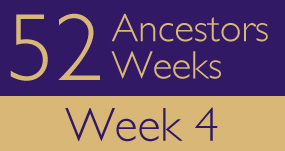 Leave a link in the comments to your Week 4 ancestor (whether or not you followed the theme)! Be sure to give the name of your ancestor — it makes it easier for cousins to find you! This week, I wrote about my great-great grandmother, an immigrant who was born exactly 150 years before me (or should I say I was born exactly 150 years after her!). She gave birth to one of her children during the voyage from Germany to New York City in 1851. Patrick Brawley was born in1884. He was my great grandfather’s brother. I’m sure he broke some hearts but I can’t help but like him. Kansas was a territory from 1854 to 1861 and then it became a state. In 1855, my 3x great grandfather, Henry Bennett, and his family settled on the prairie in this newly named Kansas Territory. They dealt with the slavery issue, sending off sons to fight in the Civil War, statehood, a severe drought and more. This week, I wrote about one of my immigrant ancestors from the Alsace area, Johann Jacob HECKENDORN, my 5th great-grandfather. This week I wrote about the three children my Great Grandparents (Charles & Annie Prudence BUTCHER nee HARRIS) had that did not survive to adulthood. By coincidence my Great Grandmother’s birthday was a few days before mine in October. Dionys DANIEL (1784-1873) from Niederscheyern, Bavaria was my 4th great-grandfather and almost shares my birthday. This week I focused on Sarah Bing Still, though I did touch on several. I was born exactly 110 years after my great-great grandfather Arthur BELKNAP of Ohio. Closest to my birthday: I have several living relatives with birthdays on the same day as mine. My mother’s birthday is only three days before mine and she is also still living. I chose my Grand-Aunt Lucille Kell because she is no longer with us and so she qualifies as my ancestor with the closest birthday. I chose Magnus Jonasson, my Grandfather’s Grandmother’s Father, we share the exact same birthday (separatede by 224 years! This was a relative that shared my birthday, but I knew nothing about him other than he died in the Korean War. My research led me on a journey that revealed a surprising and sad story. James Gates, James Gates, where are you? Talk about premature baby! Giles Allen was born less than a month after his parents were married and a few weeks before his father left for the Civil War. Although I don’t go out of my way to follow the theme, it turned out that one of his sons shared my birthday. Bonus: Check out Giles’ father’s letter home from the Civil War with its heart-breaking portrayal of the life of the Union infantry marching through the Carolinas. Mabel Condon 1895-1923. Using a personal autobiography of one of her sons to piece the life together of my Great Grandmother. Jane Murdie Bullen lived in New York State and Wisconsin and would be celebrating her birthday this week, as am I. My 9th great grandfather Stephen Gates and I share a birthday — albeit 298 years apart. But when I looked at him, he didn’t hook into my line where I expected he would — instead, he led me to an examination of one of many instances where I am my own cousin. I also looked briefly at my Gates family’s involvement with the failed attempt to put Jane Grey on the throne of England in 1553. I like this “I am my own cousin” line – in a series of fiction books by Tamar Myers, the main character says something like even when its just her and a sandwich she is having a family reunion. I wrote about my grandmother. Her birthday was the day before mine. She was devoted to family, church, and volunteer work. My paternal grandmother and I (almost) share a birthday, so she was an easy choice for this theme. Agnes Hoekstra Roorda, 1894-1924. Born in Iowa, died in Colorado. Her life was shortened by tuberculosis, a disease which I discuss at length in one of my posts relating to Agnes. Anna Olauson, sister of my great-grandmother, was born on December 1st. My birthday is December 2nd. Anna is a bit of a mystery to me, so it was interesting to write about her! 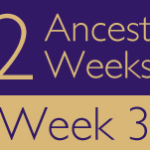 I wrote about MYSELF, in conjunction with the Week #2 Genealogy Do-over task to complete a self interview and write a bio. RICHARDS–George Fisher Richards–Happy Birthday. This is my great uncle. His birthday is one day before mine. Jordan BRIDGE d 1546, and a bit of ‘Synister labor, Craft and subtilite’ in conning his brother out of the inheritance. This ancestor and I share the same birthdate. In my direct ancestral line Harriet Vitty was born 2 days and more than 175 years before me! Theodora married at least three times in her life, leaving her first husband with five small children to raise alone. WILLIAMSON — “Mary Ann Williamson, Who Knitted Her Way to Indianapolis” on Green Family Archives. My 4th great grandmother and I share a birthday and a fondness for knitting! I share a birthday with my great-grandfather, John F. Beermann; but, there’s more! He and my great-grandmother, Anne Schulte, married on his birthday, so I also share their anniversary, as well. Christina Shafer Dellinger, my 5th great grandmother, has a birthday 3 days after mine. She was the daughter of German immigrants to York County, Pennsylvania. Wilder, Submit – Submit shares my birthday, almost 200 years apart. Although I only met him once, my paternal grandfather celebrated his birthday 1 day before mine. I love 17th century Massachusetts Vital Records! STRAUSSER, Peter L. – 52 Ancestors 2015 Edition: #4 Peter L. Strausser (1852 – 1919) by Eileen A. Souza at Old Bones Genealogy. 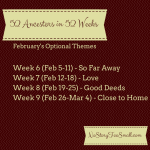 The suggested theme for this week was to write about an ancestor whose birthday was the closest to mine. I searched my database and came up with three candidates. I finally selected my 2nd cousin 4x removed, Peter L. Strausser, who was born on 25 January 1852 in Norwegian Township, Schuylkill County, Pennsylvania. I share my birthday with two living relatives and one fairly recently deceased relative, but I chose to go back in time and look at a direct ancestor rather than a collateral relative, and wrote about my 6th-great-grandmother. This week was a struggle for me. Probably because I wanted to do the theme, but my ancestor was a brick wall. I wrote about my 3rd great grandmother Margaret Roberts Bass born on April 1. I was born on April 2, thankfully missing being labeled an April Fool Baby all my life! PUTNAM, Timothy II 4x great grandfather closest birthday to mine, just a couple hundred years before. MUNCY – Samuel Muncy (1761/1768-1839) Who’s Your Daddy, Your Mamma and Your Kids? It is through my genealogical journey that I learn that my grandfather and I have the closest birthday. What a nice discovery. I’m still working on any of the women ancestors way way back in my tree: Here’s my 8th great-grandmother, baptized on my birthday: Alice Gaylord (1595). I wrote about a mystery missing child who may have died in the 1918 influenza pandemic. John Gates, John Gates, where are you? Did you ever get shown movies in school about houses catching on fire? In second grade they showed me a movie about a cigarette lighting a couch which caught the drapes, etc. For years, I couldn’t sleep until I’d surveyed all the electrical sockets and other areas of the house for smoldering fires. My subject this week is a Quaker 5th great-grandmother, Elizabeth Jessop, of Perquimans Co., NC. I took a little break from the them this week and covered a special occasion; my Mother & Stepfathers Vow Renewal. It was nevertheless a special month for birthdays, albeit not mine, with my Step-father, Auntie and Step-grandmother all celebrating birthdays. Also if my Grandad had been here (see previous 2015 blog on him!) it would have been his birthday too! Please take a nosey to enjoy photos of our celebrations including a link to speeches. 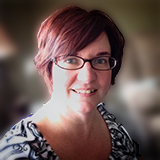 If you like the English accent, you will enjoy – I’m speaking on there too!! Nellie MISCOVITCH (nee ADAMSKI) was my grandmother. We shared many a birthday cake. Eunice Foss Johnson, my 4th great grandmother with whom I share a birthday. ALLWARDT, Sophia Christina Carolina (1834 – 1916). My 3rd-great-grandmother, born just after the abolition of serfdom in Mecklenburg to ex-serfs, and emigrated with her (extended!) family to Wisconsin. I share a birthday with my great uncle, Elmer Felzien. I shared some photos from Elmer’s childhood.